The nonprofit Access Project, which studies community health care and access to it, recently looked at noncorporate farm and ranch families' health insurance and medical costs in the Great Plains states and California. The findings in both were similar: Health care poses a financial hardship. Nine in 10 have health insurance, but nearly a quarter (23 percent) report that health care costs have caused them financial difficulties. Families with financial difficulties report spending 42 percent of their income on health care coverage and medical costs. The average farmer spent more than $8,500 a year on health care costs, compared with a median $4,630 for those who got insurance through off-farm or ranch employment. Nearly a third (31 percent) spent more than 10 percent of their income on health care, including insurance and out-of-pocket costs. Among those whose livelihood primarily is farming or ranching, the figure rose to 37 percent. 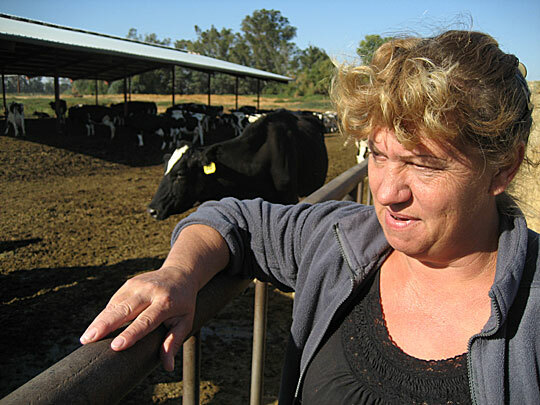 Paula Floriano and her family run a dairy farm in Atwater, Calif. Because of high health care costs, she says she and her family don't seek medical care unless it's absolutely necessary. Many U.S. farmers are struggling to meet their health care costs. A recent survey by the nonprofit Access Project says they pay twice as much as nonfarmers do for insurance and out-of-pocket expenses. As small-business owners, they have few options and often buy insurance as individuals. 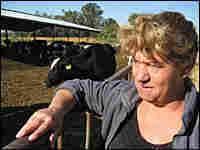 Paula Floriano, a 43-year-old dairy farmer, lives in the California Central Valley town of Atwater. She and her husband, Paul, have two teenage kids. The couple and son Nicholas work the farm seven days a week, starting at the crack of dawn to tend their 125 cows. Today, she is raking hay near the calves' pen. Her blond hair is firmly clipped up and a cigarette dangles from her mouth. "Usually, I'm the cleanup crew, and then when the milker's off, I feed the heifers, the dry cows, then all the smaller ones," Floriano says. "Then I give milk to the young ones." Farming is a high-risk occupation, with heavy machinery, large animals and the possibility of exposure to pesticides and other toxic substances. That can result in farmers having to pay more for health coverage. Right now, Floriano pays about $1,000 a month for her family's health insurance — excluding dental or vision coverage. Her coverage pays for only a few doctor visits a year, she says. There's also a $10,000 deductible for medical care before insurance kicks in. With all these costs, Floriano says sometimes other bills have to wait. Insurance costs eat into the family's limited income, she says. Less than two years ago, Floriano's husband got stung by bees and had an allergic reaction. "So we went over here to the clinic, and that bill was $1,900 after the insurance picked up," she says. "So, you know, we try not to go unless ... we really have to." Like the Florianos, many other small-business owners buy their insurance as individuals. Still, they represent only 5 percent of those who are insured. That's one reason why individual coverage is so expensive, says Scott Leavitt, president of the National Association of Health Underwriters. A small pool of people makes it harder for the insurer to spread out risk. The other reason is that "when you do buy an individual policy, there's nobody else paying any other share of the premium. You do pay the entire cost," he says, noting that an employer typically will pay 50 percent of a worker's insurance premiums. Regardless of why health insurance is so expensive, Karen Pollitz, a professor at Georgetown University's Health Policy Institute, says the bottom line is that the individual market is a mess. "Nobody would design a system for financing health care like the individual market that we have today," Pollitz says. "It's volatile, it's unstable, it's expensive, it's dangerous and people can really get hurt." Besides the health risks of delaying or not seeking medical care, there is potential for financial ruin. In the Access Project's survey, one-fourth of farmers said they used other financial resources to cover health care costs. More than half reported using family savings; a quarter took on credit card debt; and others borrowed against their farm or asked family and friends for help. Pollitz says one area in particular worries her: Small-business owners, including so many farmers who buy their insurance as individuals, are at risk of paying higher prices when they have pre-existing conditions such as cancer or diabetes. Massachusetts, New York and a few other states guarantee that everyone can get health insurance and pay similar prices for it, she says. But most states don't have such provisions. "So your protections in this market are much less, compared to group plans where federal law says it's just not allowed to discriminate against people based on your health status," Pollitz says. "In this market, you always get discriminated against based on your health status." Rich Matteis is an official with the California Farm Bureau Federation, an advocacy group. He finds the discrimination "disconcerting, that's for sure." He would like to see his roughly 90,000 members pay less for health care. However, he is not in favor of major insurance industry regulation. Instead, he says farmers should have the choice of more health plans with higher deductibles and lower premiums. But, back at the dairy farm, Paula Floriano says it's going to take more than that. She says lawmakers need to change the health care system that she believes punishes small-business owners. Floriano wants elected officials to "tell the insurance companies that these small businesses need their insurance, and you will work with them and regulate it," Floriano says, "not that they can charge outrageous prices and, you know, really stick it to ya." For now, Floriano will have to wait. There's no significant movement at the federal or state level to restructure the individual market. All eyes are on the new administration to see what will come of its plans for health care. Kelley Weiss is a reporter for Capital Public Radio station KXJZ in Sacramento, Calif.